Only the unexpected can be expected in a Victor Ortiz fight and last Thursday’s fight proved to be no exception. 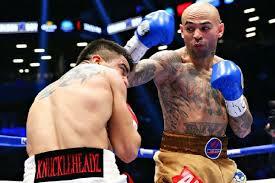 However, credit cannot be taken away from Luis Collazo. Ortiz may have been the favorite going into this fight, but Collazo is no pushover and Ortiz would quickly find that out. Fighting in front of his hometown at the Barclays Center in Brooklyn, Luis Collazo (35-5 18KO) reignited his career with a thunderous right hook that knocked out Victor Ortiz (29-5-2 22KO) and possibly his own career. The first round was competitive with Ortiz throwing the harder punches and Collazo throwing the more accurate shots. Ortiz looked tight and seemed too eager to attack. The fighters took turns putting pressure and backing up but both were effective. The second round started where they left off but as the round progressed Collazo began to land more often as he took advantage of Ortiz’s over-aggressiveness and landed check right hooks and straight left hands. The end was almost advertised as Collazo landed two right hooks before delivering the killer blow. Ortiz was off-balance but tried to throw a wide right hook. Collazo saw the obvious opening and delivered a short, compact right hook that stunned Ortiz and put him down. With his back to the referee, Ortiz was counted out. This victory propels Collazo’s career, even if the win came against a ‘name’ fighter. He showed world-class skills and responded to his underdog status the way a fighter should, by showing the favorite that he is no pushover. He called out Floyd Mayweather but that fight is unlikely. However, there are many options for Collazo in the welterweight division. For Ortiz, rumors about retirement reflect the bleakness of his status right now. This is his third straight stoppage loss, starting with a KO at the hands of Mayweather after an intentional headbutt by Ortiz. Then, Josesito Lopez, a good but B level fighter, gave Ortiz hell then broke his jaw, forcing Ortiz to quit on his stool. Ortiz took a long layoff after that, performing on “Dancing with the Stars” and filming “The Expendables 3”. After watching this former top prospect deteriorate in front of my eyes both against top level and B-level competition, maybe he should stick to the camera. He could also hire a new trainer and reestablish himself. But he’s already had three chances to do that, so never mind. The point is if Victor Ortiz’s heart is not in boxing, then this sport is going to eat him alive, if it hasn’t already started. He looked rusty, inexperienced, and just plain silly in his offense. He needs to seriously make a choice. The ring or the camera?